The Senate on Friday morning is set to hold a crucial vote on whether to advance Kavanaugh’s nomination to the nation’s highest court. A final vote is set to occur on Saturday. Without evidence, Trump claimed the protesters are “paid professionals only looking to make Senators look bad.” Trump suggested billionaire George Soros was among those allegedly paying the protesters. The president’s description of the protesters as “elevator screamers” seemed to be a reference to two women who confronted Republican Sen. Jeff Flake last Friday as he boarded an elevator and tearfully told him about their experiences as sexual assault survivors. Flake was speechless as the women told him that moving forward with a vote on Kavanaugh’s nomination would send a deeply troubling message to women about sexual assault. 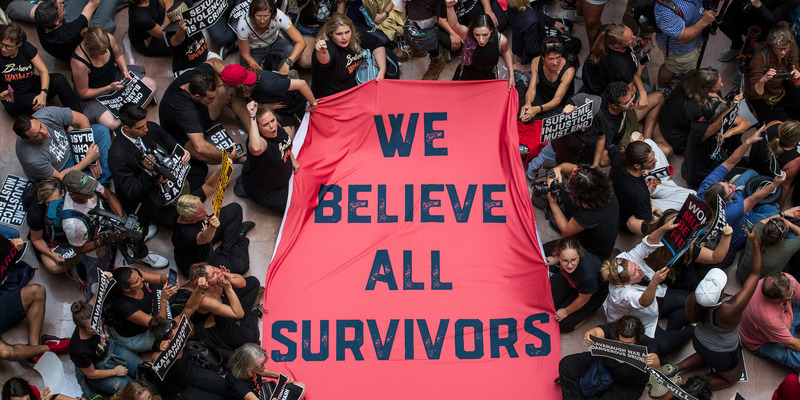 “You’re telling all women that they don’t matter, that they should just stay quiet because if they tell you what happened to them you’re going to ignore them,” Maria Gallagher, 23, said to Flake during the emotional encounter. WATCH – KAVANAUGH protesters hold open JEFF FLAKE's elevator on his way to the Senate Judiciary Committee. Kavanaugh has been accused of sexual misconduct by multiple women. Last Thursday, Kavanaugh and one of his accusers, Christine Blasey Ford, delivered testimony on her allegations. Subsequently, an FBI investigation was launched into the allegations, which concluded on Wednesday. Critics feel the investigation was not extensive enough, creating tension between Senate Democrats and Republicans as they moved toward a vote on whether to advance Kavanaugh’s nomination.